me and my husband like to travel and a lot and we make sure to have a small vacations for 2-3 days every month. however our biggest challenge is our breakfast and lunch during our vacations. being a vegetarian offers us very little options here in australian restaurants. even the big chains like mcdonalds and kfc does not have any veg meal options except french fires or chips. 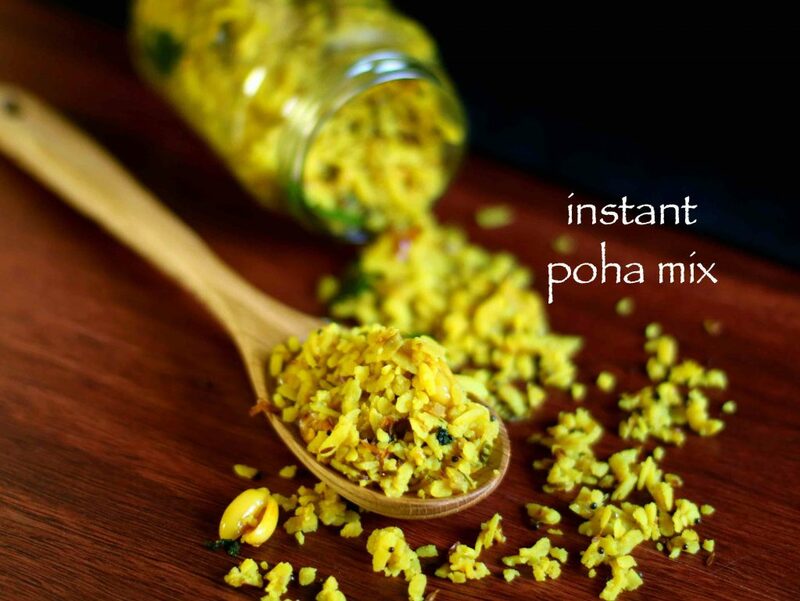 to tackle this problem i always fall back to my instant mix recipes and one such option is ready to eat poha mix. 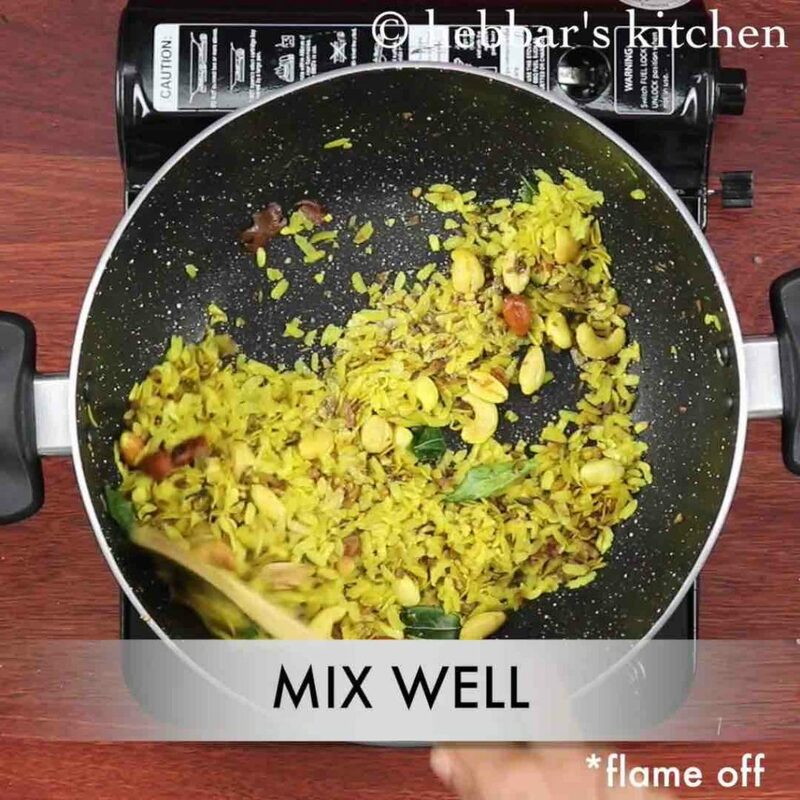 it so easy that you can prepare the same soft and tender poha recipe by just adding hot water and rest it for 15 minutes. 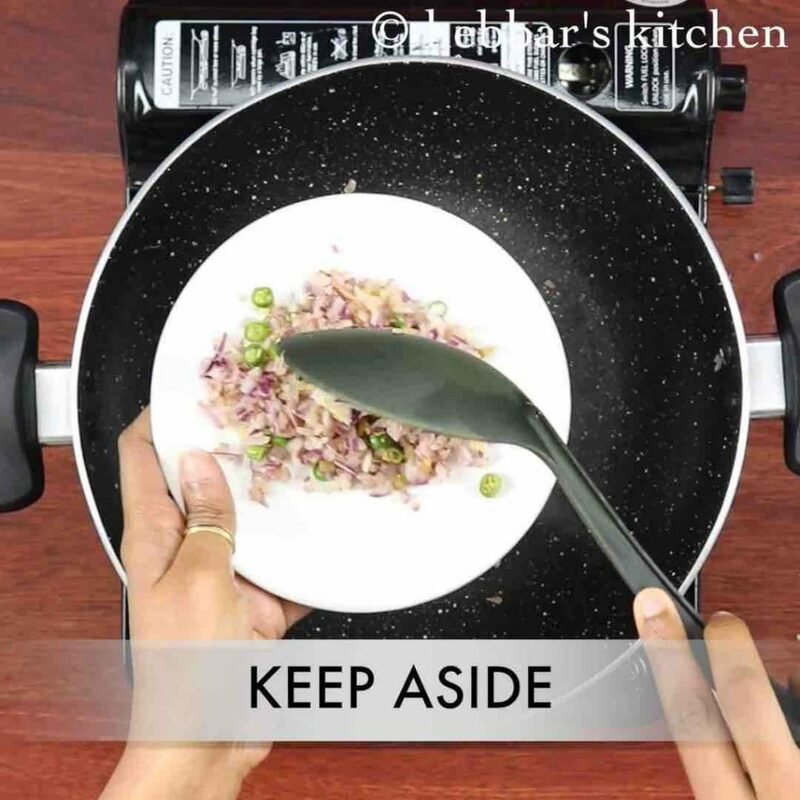 while there isn’t any complicated steps in ready to eat poha mix recipe yet i would like to share few tips and suggestions. 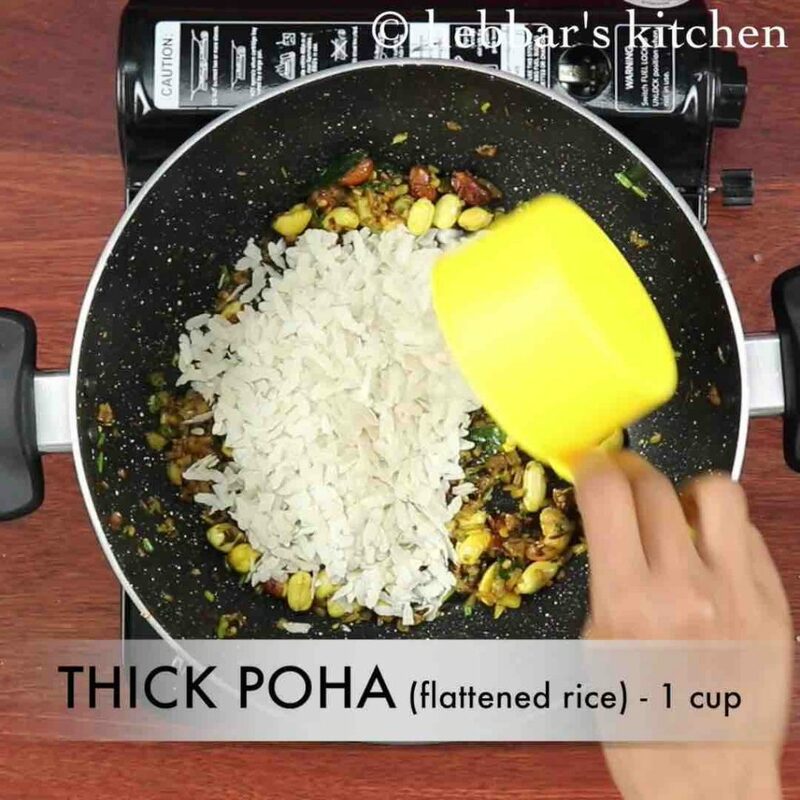 firstly, always use thick poha in this recipe and thin or medium poha is not recommended. secondly, always dry roast onion, ginger to remove the moisture content from it. once dry roasted, roast it again with oil and mix with other ingredients. 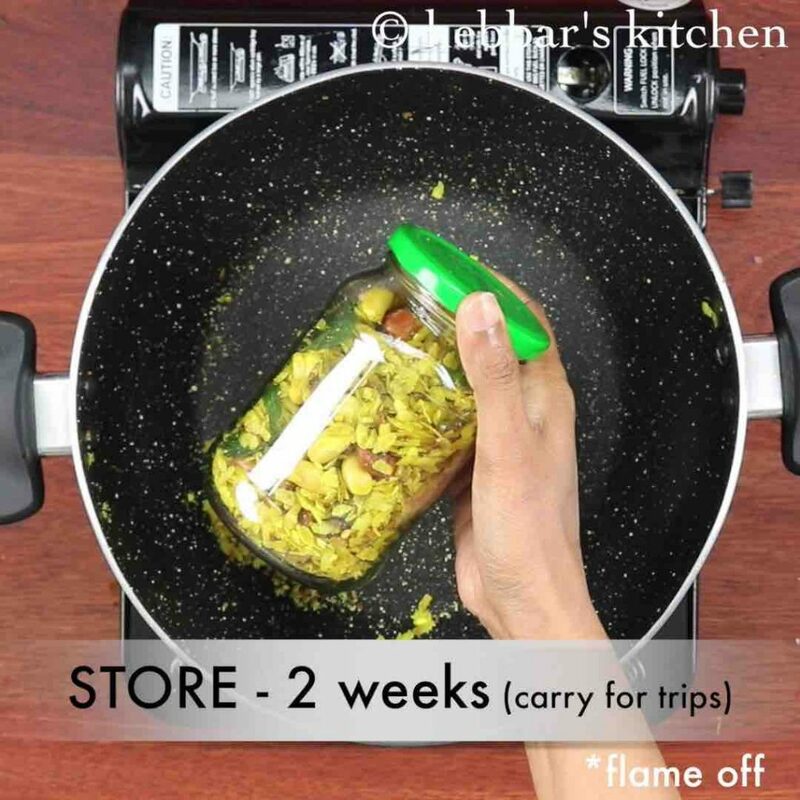 finally store instant poha mix in a air tight container and it should last for minimum a month or two. firstly, roast onion, ginger and chilli without adding oil. roast on low flame till all the moisture is reduced from onions. now to the same kadai heat oil and roast peanuts. add in mustard seeds, jeera, urad dal, dried red chilli, hing and curry leaves. 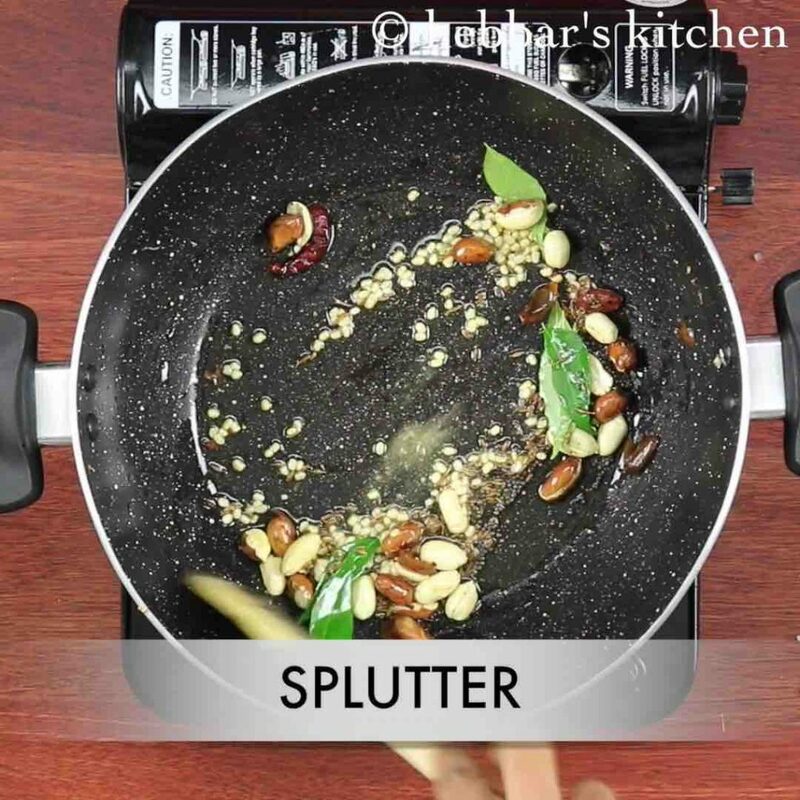 saute till the tempering splutters. now add in cashews and saute. furthermore, add in previously sauted onions, coriander leaves and turmeric. saute for 2 minutes or till onions gets cooked well. 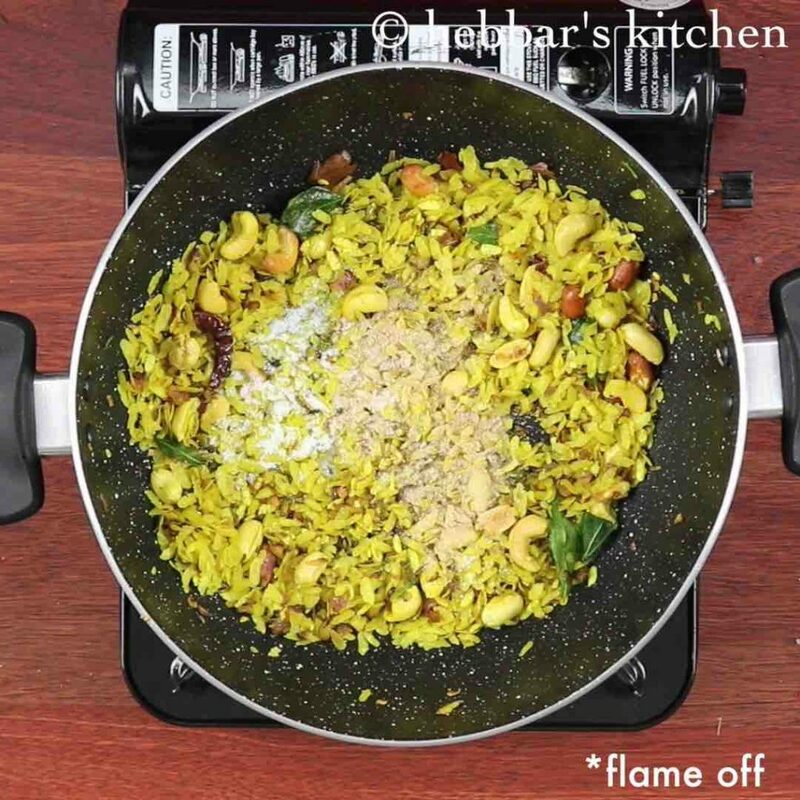 now add in thick poha and saute on low flame for 15 minutes. furthermore, add in sugar, salt and aamchur powder. 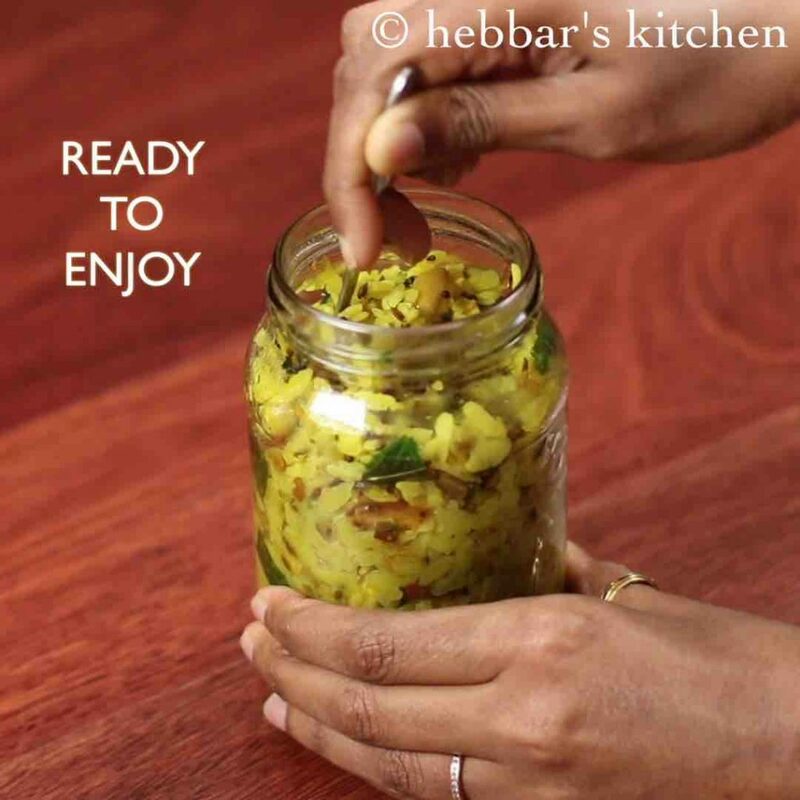 mix well and transfer the poha into a glass jar or a ziplock bag. 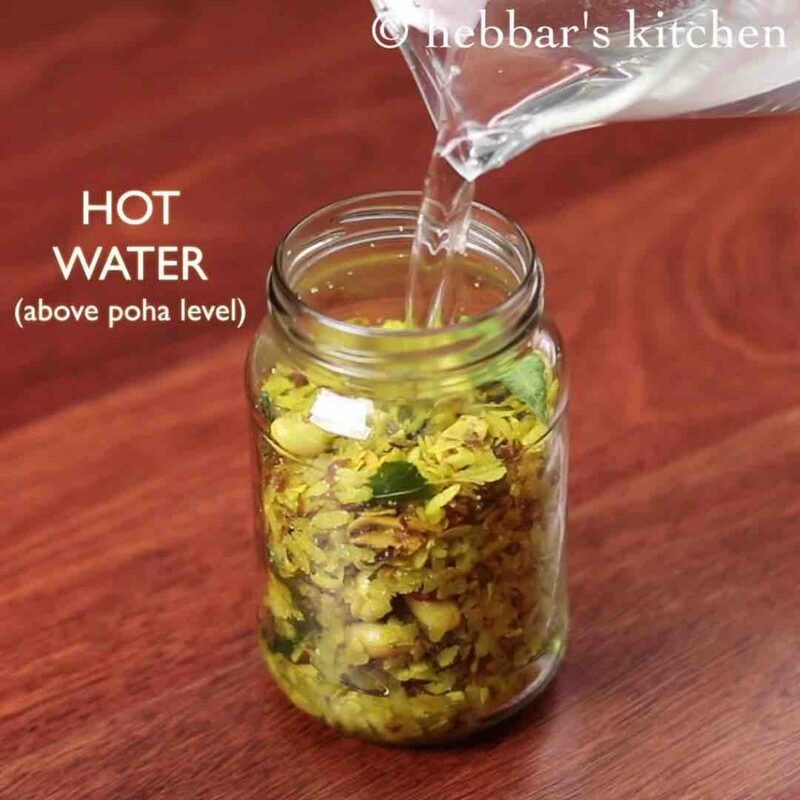 to prepare poha, add in hot water just above the level of poha in jar. close the lid and allow to rest for 15 minutes. finally, serve poha prepared with instant poha mix. 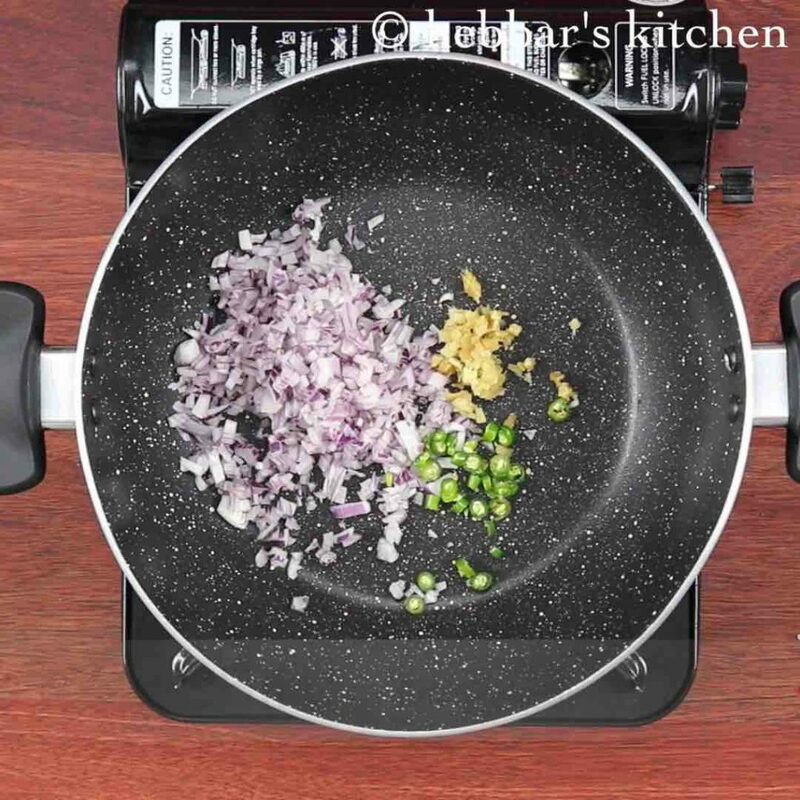 firstly, in a thick bottomed kadai roast ½ onion, 1 inch ginger and 1 green chilli without adding oil. now to the same kadai heat 2 tbsp oil. 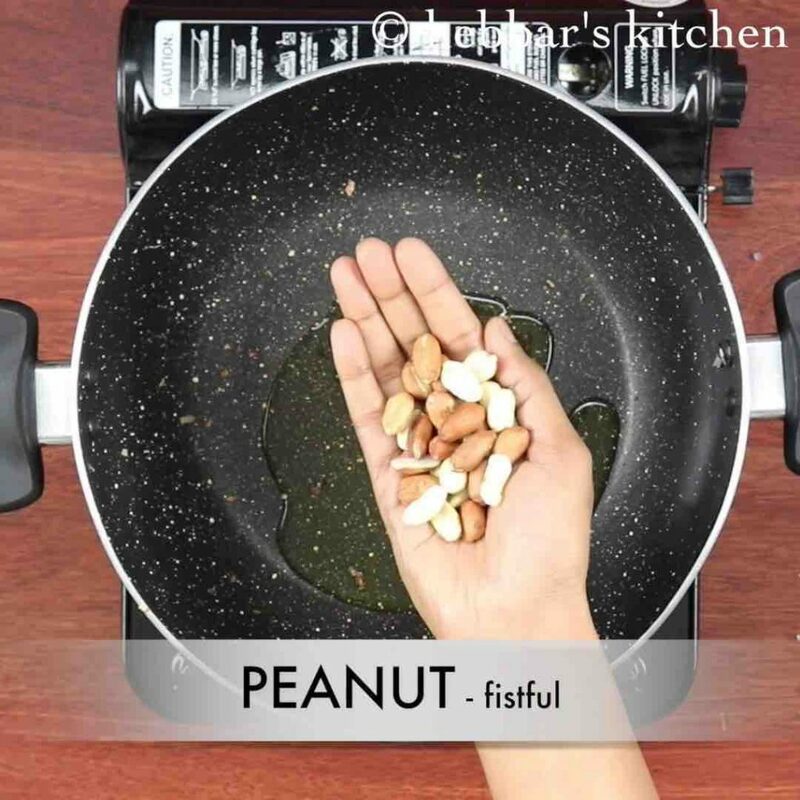 roast in fistful peanuts till they turn crunchy. 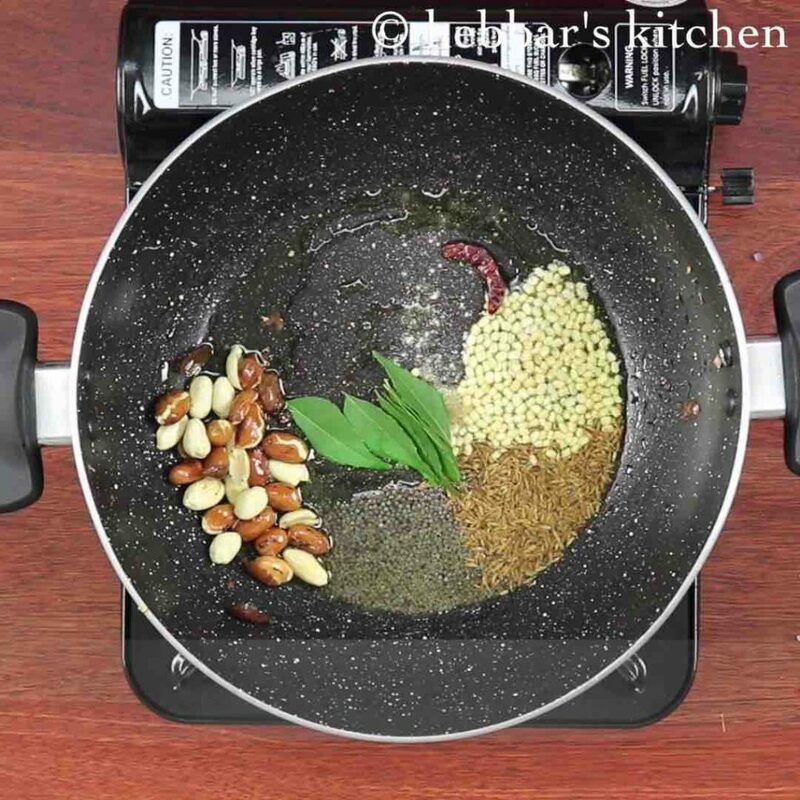 add in 1 tsp mustard seeds, ½ tsp jeera, 1 tsp urad dal, 1 dried red chilli, pinch of hing and few curry leaves. 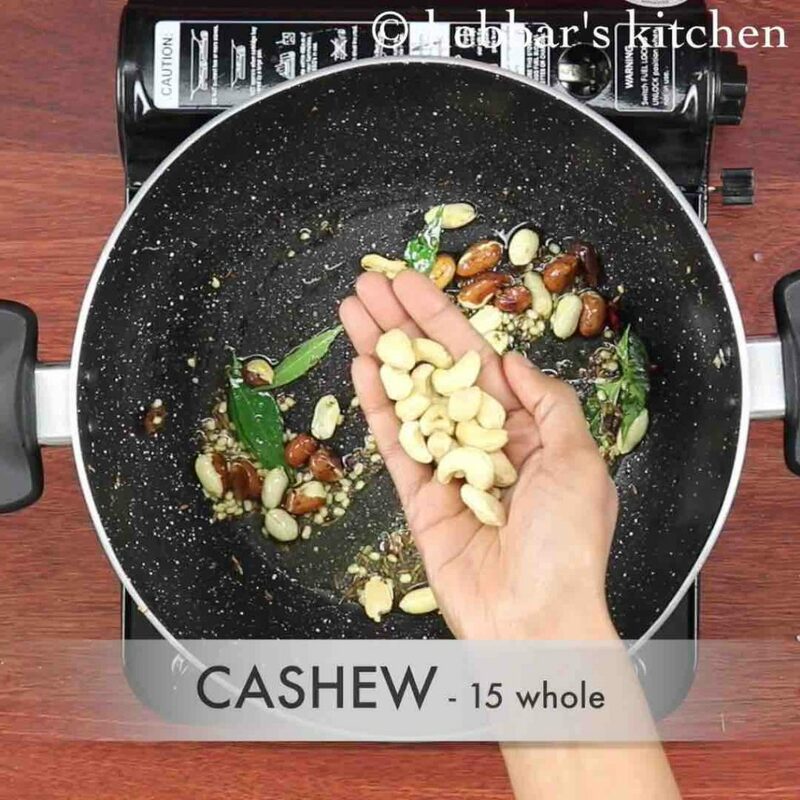 now add in 15 whole cashews and saute till the cashews turn golden. 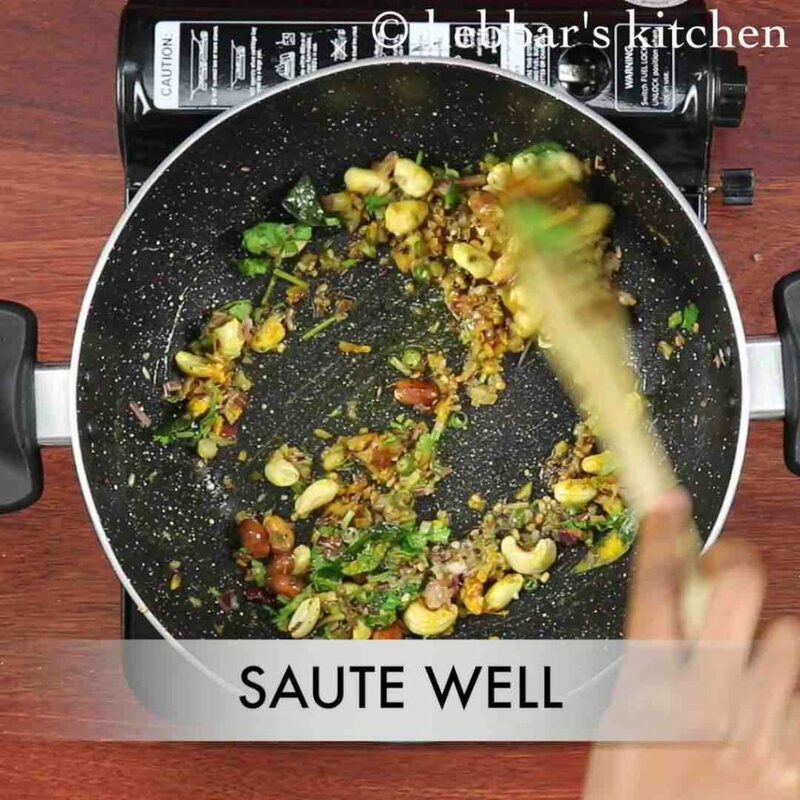 furthermore, add in previously sauted onions, 2 tbsp coriander leaves and ½ tsp turmeric. now add in 1 cup thick poha. make sure to have clean poha as we are not washing. saute on low flame for 15 minutes. 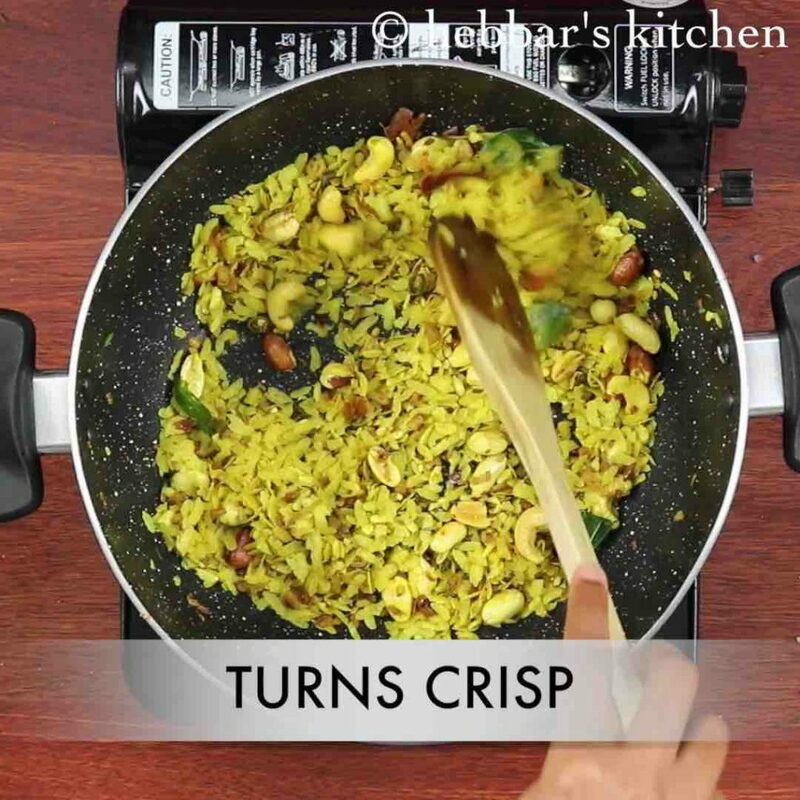 make sure the poha turns crisp and not have any moisture. furthermore, add in ½ tsp sugar, salt to taste and ¼ tsp aamchur powder. mix well making sure everything is combined. 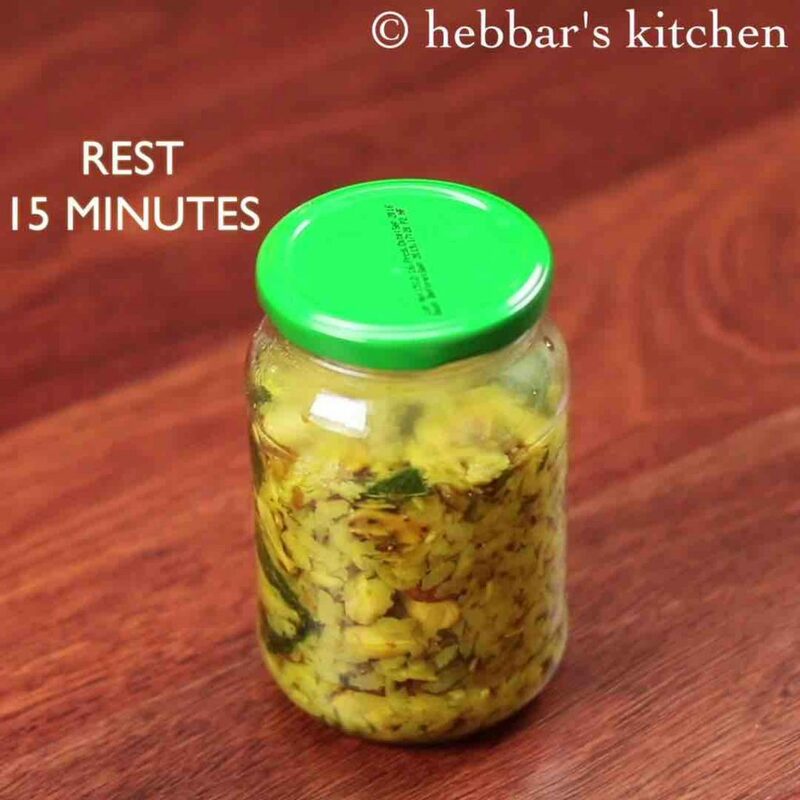 now transfer the poha into a glass jar or a ziplock bag and can store for 2 weeks. refrigerate and use for a month. 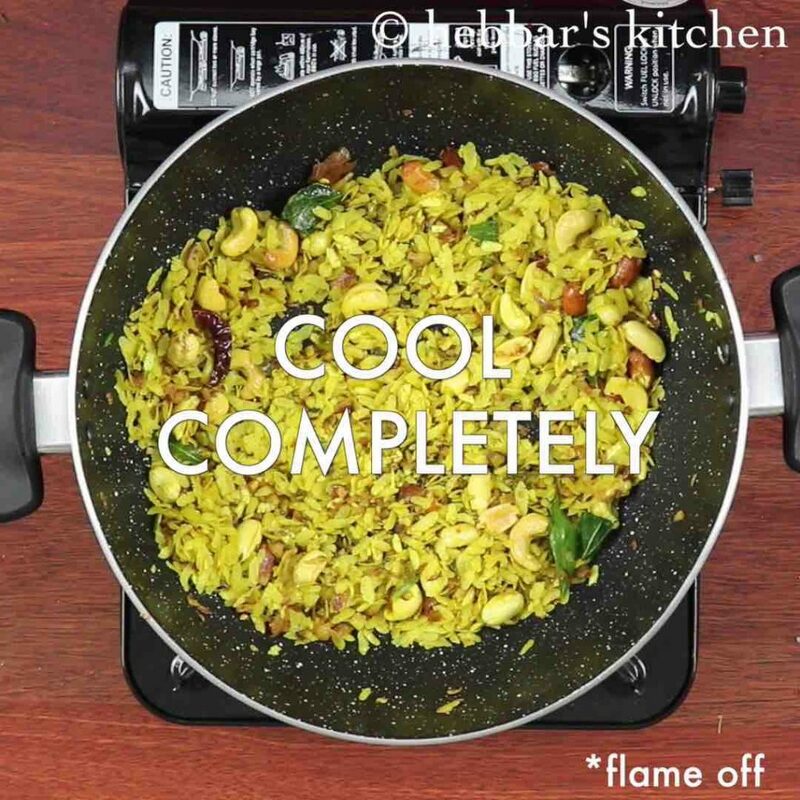 close the lid and allow to rest for 15 minutes or till all the water is absorbed by poha. 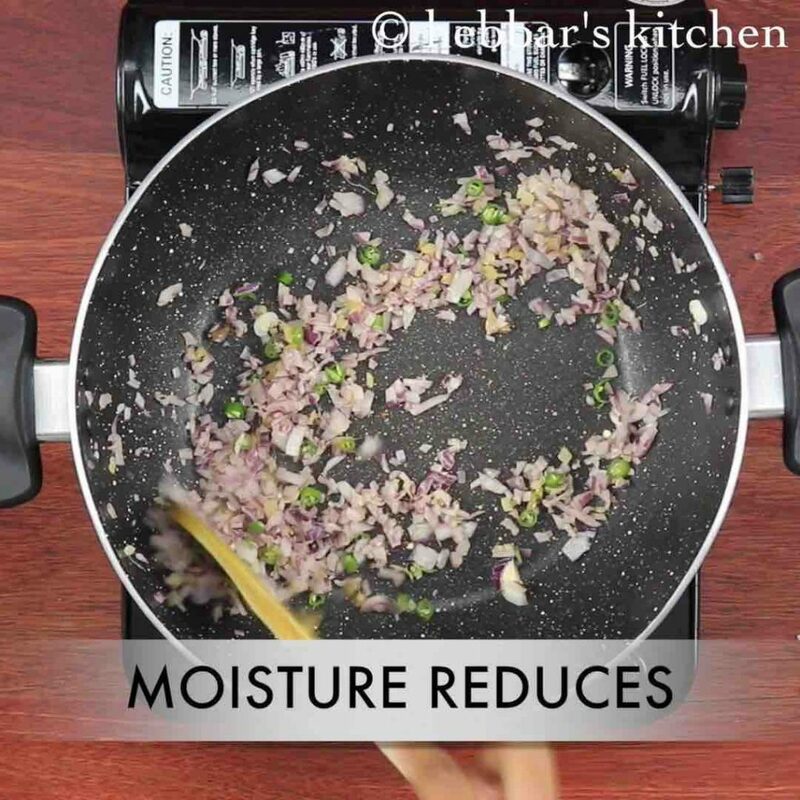 gently, fluff the poha to make sure the water has absorbed well. 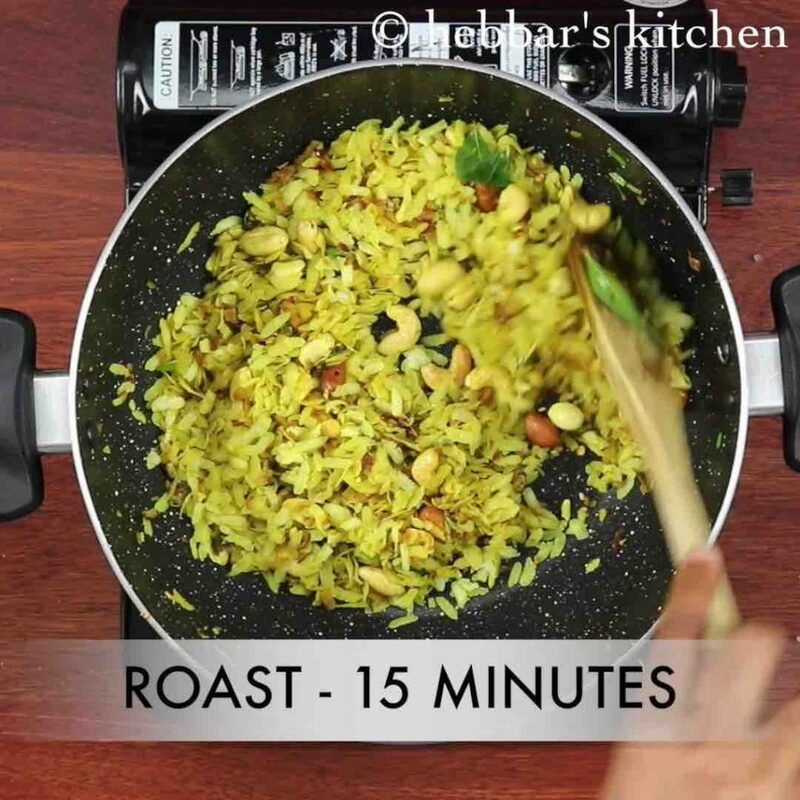 firstly, roast the poha till they turn crisp else, it wont last long. also add salt and sugar only after the mixture has cooled completely, else water will be released from salt and sugar. additionally, prepare in large quantity and can be taken for trips and picnic. 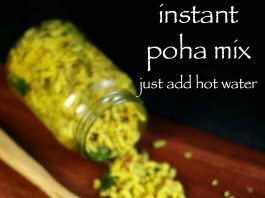 finally, use hot boiling water to soak poha quickly while preparing from instant poha mix. All your recipes are super. Can you please recipe for both gojju avalakki and instant gojju avalakki which will yum during travel? hi.. awesome recipe.. thank u.. how much water do u add for this? Thank you..add hot water just above the level of poha in jar. good recipes, not only this, all are really tasty, i tried most of the south Indian recipes. 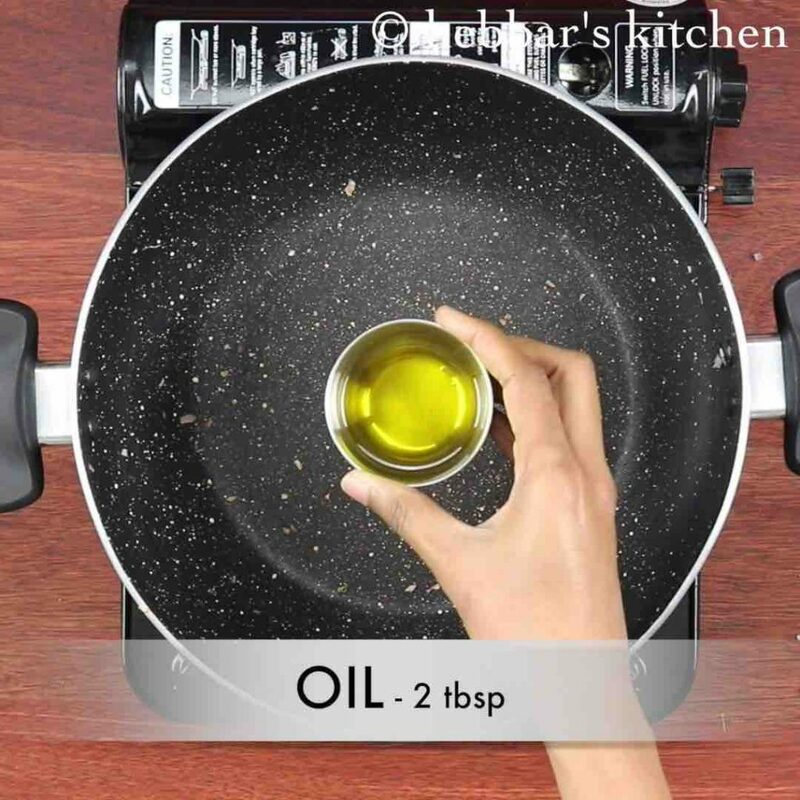 the way of presenting the recipe is really amazing, i like the videos very much. with good measurement mechanism as well. congratulations to the team . way of categorizing is very professional. very user friendly app and web. quick and instant recipes are the best. How many days can it be stored? 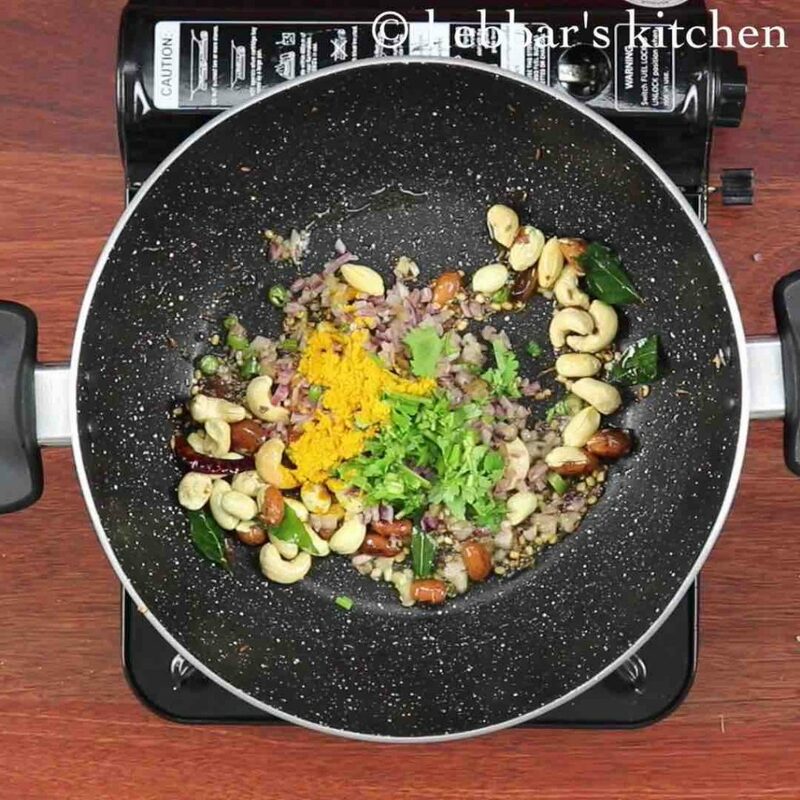 n I’m a non vegeterian n ur blog is ofcourse great to prepare easy n tasty vegetarian foods with available ingredients..thnx fr ur recipes…..
How much water to add when ready to eat? 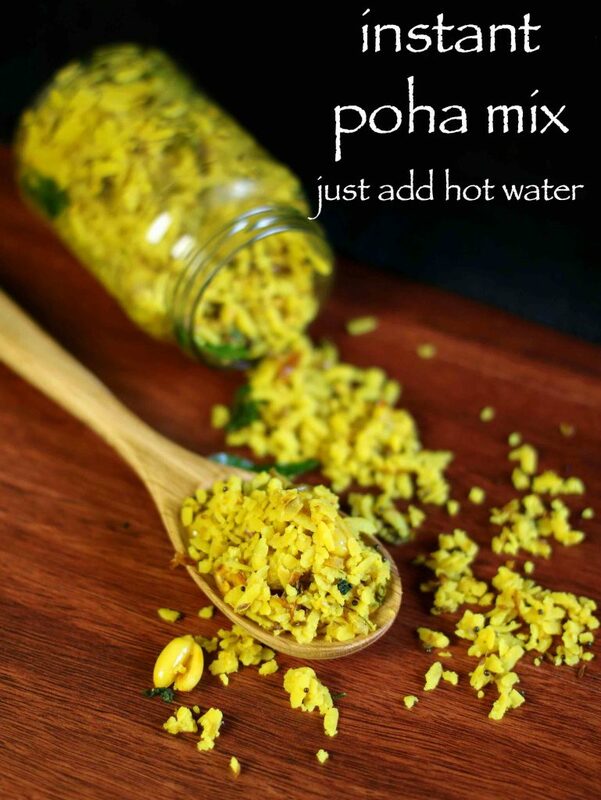 add water till above the level of poha.. Thank you! How long does this mix last? 1-2 days? Good one. Really creative. Superb for short trips. excellent idea specially if going for vacation with kids. Different version I liked it, will definitely try this. What type of poha is this. Medium or thin or thick. In UK like this variety I get. oh my God!! this is jus amazing! !